The NBA is very gradually cutting ties with the state of New Jersey. The Nets have obviously departed East Rutherford and Newark for Brooklyn, and the NBA shut down its offices in Secaucus during the lockout. As a result, the draft lottery was held in Times Square, not Secaucus, this past year, and one can assume that it won't be headed back anytime soon. 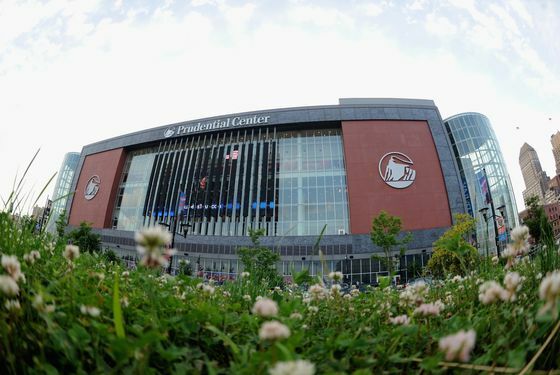 The last vestige of NBA presence in the Garden State comes tonight, when the draft will be held at the Prudential Center for the second consecutive year. The move was only made because Madison Square Garden, the usual venue, is in summer number two of a three-summer renovation. With the Nets gone, we now have a major event taking place in a building and state that aren't affiliated at all with the NBA. That said, "The Rock" does have some things going for it. For one, "The Pru" (so many cool nicknames) holds the draft in a portion of the actual basketball arena (or at least they did last year), while the Garden has recently been stuffing the event into the WaMu Theater. Beyond the obvious benefit of having more seats — something I am judging by eye, not by actual numbers, but it's pretty obvious — Newark's flexible space lends itself better to the bizarre layout of the presentation. Viewed live, the draft has sort of a three-ring circus feel to it, with the stage, the "green room," the table of analysts, and the post-pick armchair setup all in view of the audience. It's much less dizzying when those elements aren't obscuring one another. Oh, and if you're a member of the media (a subset of the population that is rapidly increasing from one draft to the next), the Prudential Center has vastly superior wireless Internet and free food options. More media seating, too. Just saying. Granted, the major downfall of Newark is that it is: 1. All the way in Newark 2. Newark. The event will more than likely head back to the Garden as soon as possible (2014 at the latest, I assume, but perhaps next summer), thus leaving New Jersey totally devoid of NBA activities. As someone who grew up in that fine state (albeit hating the home team), the prospect gets me a little misty. I won't be at the draft tonight, but if you will be, take a deep breath of that sweet, sweet Jersey air and say farewell for me.